This fantastic candle in a tin is a great way to neutralise unwanted odours when cooking, leaving your home smelling fresh and clean. 25 hour burn time and comes in a metal tin measuring 4cm tall and 6.5cm in diameter. This fantastic candle in a tin is a great way to neutralise unwanted odours when cooking, leaving your home smelling fresh and clean. This fantastic candle is made with extracts of clear basil, oriental patchouli and floral geranium. This candle is perfect to take with you when you travel for example if you stay in a caravan. This chef’s candle has a fantastic 25 hour burn time and comes in a metal tin measuring 4cm tall and 6.5cm in diameter. Price’s candles have been around for 170 years and have a long and close association with the Royal Family. Today it holds a Royal Warrant for Her Majesty which means that Price’s supply candles for many Royal State occasions. They claim that candles are not just sources of natural light but are aesthetic, fragranced and highly designed objects in their own right. © Please do not copy text. 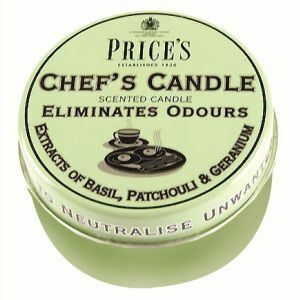 Avena product description – Chef’s Eliminates Odours Candle by Price’s.